Last weekend I fell in the river. I was keen to clear a bit of it that had got rather clogged up with logs, twigs and sticks after the last flood and had set out, pole in hand, to sort it. I was leaning right over the river against an old tree stump in order to get the pole into the middle of all this debris when there was an almighty creak followed by a splash. It seems this particular stump had long ago relinquished its hold on life, was entirely hollow and both it and I fell right into the river. It was very cold. I had been accompanied on this mission by Tom who, uncharacteristically for a Springer, doesn’t like water and was now pacing the riverbank anxiously presumably wondering what I was doing. So, I was soaking to the waist and my boots were full of water but as I couldn’t get any wetter I decided I might as well carry on clearing the river and in fact it was much easier now that I was well and truly in. Climbing out I found myself on nose level with swathes of wild garlic which is abundant along the bank and decided that is what we would have for supper. Each year we are spoilt with this particular foragers’ treat and I have made all manner of things with it, Wild Garlic Pesto (May 2013) and Wild Garlic Focaccia (May 2014) to name two. I add it to salads, cautiously though it is pretty potent, and chuck into pasta dishes letting it wilt in the residual heat. This years leaves have been around for a couple of weeks but it is only in the last few days that the white flowers have emerged. We often make pizzas on a Saturday evening so I decided to see how much wild garlic we could get onto those. My dough is a simple version of my white bread but with a good slosh of olive oil. It is a dream to work with and cooks to a suitably crisp crust. I decided to make my Fresh Herb Sauce (July 2013) with half parsley and half wild garlic which resulted in a pungent fabulously green number to drizzle over some of the pizzas when they emerged from the oven but you could just as happily use the Wild Garlic Pesto. 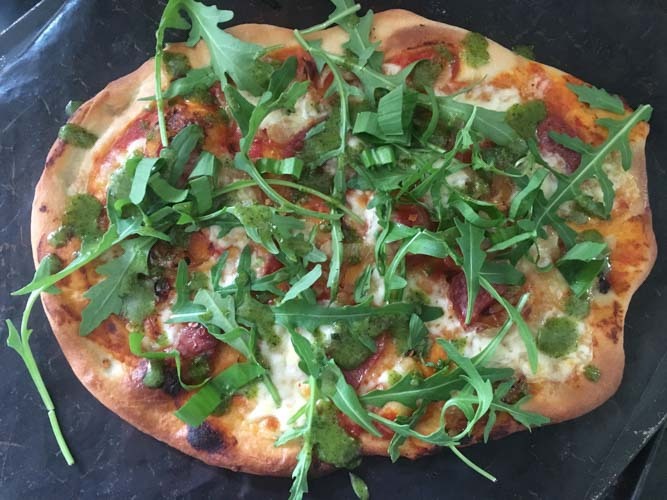 We strewed the pizzas with torn wild garlic leaves rather as I often use rocket and in fact rocket came into play when the wild garlic I picked had all gone and I couldn’t persuade anyone into the pouring rain to get more. Pizzas are a personal thing and us such my family put different ingredients on each one – we usually start with a tomato sauce, the same one as used in my Meatloaf recipe (November 2015). My son keeps his simple with cheese and salami, my daughter will add olives, capers and garlic to hers and my husband and I tend to add a good amount of chilli, mozzarella and lots of greenery when the pizzas emerge blistered and bubbling from the oven. A trickle of good olive oil and a sprinkle of sea salt bring the whole together and I can’t recommend these enough. They are a world away from wodgy doughy shop bought pizzas and, I tell myself, must be better for us…. The following makes four pizzas which are just the right size for us, two adults and two children but you could happily double the recipe. Remember you need to allow time for the proving but unlike normal bread, the doesn’t really need a second rise. Mix the flour, yeast, salt, oil and 100 ml of water in a large bowl, you may need some more of the water but probably not all of it. Once it comes together in a dough knead it for 10 minutes by hand or in a stand mixer. When this is a smooth ball, put a little oil into the bowl to stop the dough sticking and leave in a warm place for an hour or so until doubled in size. Preheat your oven to 220 and put in a couple of baking sheets to heat up. Divide the dough into four and roll out thinly but not too thinly or you will struggle to get them from your work surface onto the baking tray. If you are worried about his roll them out on baking parchment and they can cook on this. Don’t use greaseproof paper as the pizzas will stick to this, you will never get them off and will have to eat the greaseproof paper along with the pizza, I found this out the hard way. Add whatever toppings you have decided on but don’t go mad, if they are too heavy or wet you won’t get a crisp bottom. Carefully take a hot baking sheet out of the oven, sprinkle with semolina if you have some or flour, put your pizza onto this and bake for 8-10 minutes or until cooked, bubbling and blistered. When it is done I thoroughly recommend torn wild garlic if you can get some or rocket strewn on top or the wild garlic fresh herb sauce. Each pizza serves 1.